In this post we look at the remainder of Buckminster Fuller's model boat collection that was recently donated to Penobscot Marine Museum. See our previous post for the first half of the collection. Chinese junk. Lightweight wood, possibly bamboo. This model has enough detail so that it might be possible to associate it with a specific type, even though some of the features are overly simplified (e.g., the capstan) and others appear to be out of scale. The rigging and the house, however, have received a good amount of care and seem to reflect accurate observation of a real vessel type. The masthead devices, if accurate, may help in identification. With the hull's extreme tumblehome, the vessel is clearly a bulk carrier, and the scale of the house indicates it's a fairly large one. I believe the deck planks, laid athwartships, would lift off on the real ship to facilitate loading and unloading. Three heavy wales at the waterline strengthen the hull and serve as fenders. The three-masted, fully-battened balanced lug rig is supplemented by one long sweep on each side, which I believe makes this a vessel intended for river/inland use. Deck beams extend through the sides of the house. Housetops are made of woven material, probably meant to represent bamboo or palm leaf matting. Details of mizzenmast, deckhouse, transom and the large balanced rudder of complex construction. Masthead device on mainmast (mizzen is similar). Although there are many differences between the present model and this image of a Ma-Yang-Tzu junk from Ships of China by Valentin A. Sokoloff (not the least being the single mast of the Ma-Yang-Tzu versus the three-masted rig on the model), there are a number of similarities that indicate a possible relationship, including: heavy round cross-beams at deck level; sweeps on both sides; the capstan well aft of the bow; a barrel-backed deckhouse with a raised barrel-back coachroof; a tall athwartship "horse" (located over the deckhouse, forward of the coachroof on this vessel); red-topped pins sticking up from the transom; and a balanced rudder with an acute angle at its lower aft corner. The Ma-Yang-Tzu is a river vessel, and the heavy cross-beams reinforce it and provide points of attachment for the tow line for upstream travel. The pins on the transom are for storing spare towlines. Chinese seagoing junk. With its deep rocker and high gunwales, this model represents a seagoing junk. Much of the rigging is in disarray but otherwise the model is in good condition. Although some details are out of proportion (for example, the weight of the sail battens and of the rail around the aft deck), there may be enough accurate observation here to facilitate identification with a real ship type. The color scheme on the sides, the design on the transom, the colorful pole-mounted device on the aft deck, and the shape of the oculus are especially promising in this regard. The vessel is a three-masted rig with fully battened lugsails that have a distinctly ovoid shape. The foremast has a forward lean; the mainmast is approximately vertical; and the mizzenmast rakes aft. Stern details, including painted transom design, unbalanced rudder, and heavy wales at the waterline. There is a capstan aft of the foremast and a tall windlass at the aft end of the main deck, probably used for raising sails. Two tall “horses,” (please advise concerning the correct term in the Comments) one each aft of fore and main masts, appear to be tying-off points for running rigging. There are deck hatches fore and aft of the mainmast. "Horse" aft of mainmast;, windlass; crossbeams beneath the aft deck extend through the sides of the hull. Is the pole-mounted device on the aft deck a lantern or a symbol identifying the vessel's port of call or purpose? Small junk, China. This model, somewhat less detailed than the previous one, represents a smaller, simpler vessel. It has a single deck with lower gunwales and what might be termed a schooner junk rig, with two masts, the forward one shorter and raked sharply forward. The mainmast has a slight forward rake. Both masts are set with fully battened lugsails. The foresail has a straight, vertical luff and a moderate amount of roach to the leech. I believe the mainsail is similar. As on the previous model, the rigging is in disarray. There is a capstan just aft of the foremast, and a windlass just aft of that. Also as on the previous model, there are deck hatches immediately forward and aft of the mainmast. Bow detail. The bow transom is painted red. Atop it is a heavy beam tying the gunwales together and extending beyond them: perhaps fishing nets would be drawn over it? One bow-backed deck shelter is covered with fabric, and a framework is present for a second shelter to be erected should the need arise. This makes me think this vessel is occupied by a family who would use it for small-scale commercial fishing and/or trading. The rudder is unbalanced; the tiller is missing from the top of the rudder post. A crossbeam at the top of the stern transom is smaller in diameter than the one at the bow and does not extend beyond the vessel's sides. I do not know the purpose of the horizontal beams on both sides of the vessel extending past the stern transom on this and the previous junk and on the raft that follows. They don't appear to serve as davits. If you know their purpose, please explain in the Comments. Bamboo Raft, Taiwan. This very touristy model, essentially a nicknack, was built of shell or horn and represents a seagoing bamboo raft of a type once used for fishing. It is believed that Micronesia was settled by people using vessels like this prior to the development of the outrigger canoe. Heavy crossbeams at the bow and stern are etched with zigzag patterns to represent lashings to the craft’s main longitudinal members, which would have been bamboo stalks. The mast rests on a heavy step that serves as another crossbeam amidships. On the foredeck is a representation of a basket of elaborate shape, probably for keeping the day’s catch. The item on the aft deck might represent a basket-built dinghy, a deckhouse, or possibly a net. Oars are tied to tholepins on both gunwale rails. Whether they are for propulsion or steering is unclear. A fully battened balanced Chinese lugsail is represented, but the model is entirely without rigging. The sail is inscribed “Taiwan” in English. 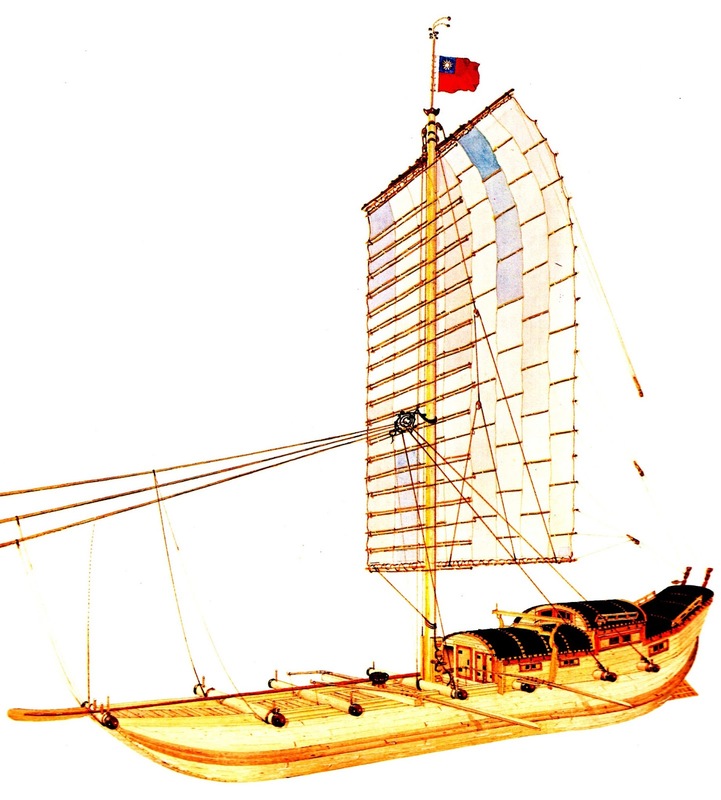 Translations of the Chinese characters and explanations of the other symbols on the sail are welcomed in the Comments. Thai Market Boat. The model represents a Thai market boat of the type used in the famous Bangkok floating market. Market gardeners bring their produce to the market in these boats and sell directly from them. The model shows the construction of this boat type fairly accurately. It is a plank-built boat of sampan construction, with wide planks laid on deep frames. An important function of the frames is to support the tall washstrakes. Boats like this are often built of teak, and the model may be as well. Most photos of the Bangkok market show paddles being used for propulsion, but the model has a long oar or sweep that pivots on a waist-high post and that would be rowed in a standing, forward-facing position. Perhaps the oar is used for efficiency in open water, then removed in the close confines of the market, where a paddle then comes into play. A teak Thai market boat very much like this model was restored by the Small Open Boats shop in Port Republic, Maryland. The long overhanging square bow allows for easy boarding and loading/unloading over the bow onto a wharf or other walkway, and the metal strips would protect it, especially if that walkway were of stone or concrete. Given the crowded conditions in the floating markets, over-the-bow loading a more efficient use of limited wharf space than tying up side-to. All the decks and floorboards of the model are loose and removable, notched to fit over the deep frames. The boat is steered by an underhung transom rudder of elegant shape. We speculate that when the oar is in use, the oarsman or -woman might operate the beautifully-curved tiller with one foot. Buckminster Fuller is normally associated with technological modernism, but it seems he had a penchant for preindustrial technology too. His granddaughter recently donated Fuller's collection of boat models to Penobscot Marine Museum, the bulk of it representing boats "outside the Western tradition," as we put it. Collections Manager Cipperly Good kindly granted us access to the collection, which the museum received with almost no accompanying documentation. Being brand new to the museum, it has not yet been carefully studied, so most of the vessels represented have yet to be identified. Of the roughly 15 models in the collection, one is American (an early 20th century powerboat hull) and three are European (20th century Greek and Danish vessels). The rest represent preindustrial types: seven are from Asia, two from Oceania, one appears to be from Africa, and one is a mystery even at the continental level. Most of the models appear to have been built for the tourist trade and, as such, may not be detailed or accurate enough to associate with real, specific vessel types. Some of them are fanciful, intended more as an artistic expression than an accurate representation. Here we present our photos the non-Western types that are not from China. (We'll look at the Chinese models in our next post.) Our identifications of types and provenances are largely speculative. As we learn more, we'll update the captions. Please help us identify the models by writing to us in the Comments. As always, click any image to enlarge. Double-hull voyaging canoe. An identification tag found inside the deckhouse (the roof lifts off in the manner of a trinket box) reads "Bora-Bora. Given to R.B.F - 1966 by native chief" (Richard was Fuller's first name.) The hulls are carved from solid, dense hardwood. The horsehead figureheads and all other features are glued on. The proper location of the spar on the table in the foreground is unknown. Many of the glued parts are coming loose but the model is otherwise in good condition. A rudder under the aft deck is steered by a massive rudder post with tillers extending from both sides. The tillers would be far too short to steer the real vessel. Horses, of course, were unknown in the Society Islands before European contact, and we doubt that they were ever used as figureheads in Bora Bora even after they were known. Samoan outrigger paddling canoe. ("Samoa" appears as part of the carved decoration on the starboard bow.) The hull is solid hardwood. The maker used the heartwood/sapwood division of his workpiece to advantage in creating a two-toned hull, with the lower half darker than the upper. Incised carving in the lower half was accentuated by rubbing in some light-colored material. Although it was made for the tourist trade, the model strives toward accuracy in some details. The outrigger extends further forward than it does aft, beginning just short of the waterline at the cutwater, but ending just past the aft outrigger struts. The complex configuration of the struts appears to be accurate. Crudely carved paddles with pointed, leaf-shaped blades are lashed to the tops of all three outrigger booms. Canoe, probably Southeast Asia. The hull and the long bow and stern decks are carved from a single piece of lightweight wood, but the model may represent a dugout or a boat with stitched or metal-fastened planks. Deck extensions or seats located just inboard of and slightly lower than the decks were added separately, as were three sitting thwarts. All of these added pieces rest on a ridge carved on the hull's inner surface. (This model) is an abstraction of sampans from Tonle Sap Lake in Cambodia or from that connected section of the Mekong river. These boats range in size from about 12 ft [4 m.] to about 25 ft [8m]. Each end is smoothly carved from one log piece with stepped insets for each level of planking of the main body. The keel connecting the two carved ends is also deeply shaped following the a curved cross section. The minimum number of planks each side of the keel is 3 with 1 washstrake plank increasing to 4 or 5 with 2 washstrake planks. Most planking is carvel on frames, decks are planked parallel to the gunwales. Washstrakes stop either short of both ends or one end only with the other end resolving to the carved ‘stems.’ Most examples seem to be more curvaceous in plan that the model, but the inset carving on the model does not seem to be present on the common examples that I’ve seen, however they are painted in varying colours: blue for the exterior, reds and oranges for the upper stem facets and the rest left uncoloured. Whatever the case, these sampans are supremely elegant. We thank Mick for the input and agree with his identification. In fact, we blogged about the paddle-propelled boats of Tonle Sap here and here, and several of them are indeed clearly of the type that the model depicts. Most upper surfaces are decorated with incised carvings of geometric and floral designs. The two long-shafted paddles have bulbous end-grips and blunt leaf-shape blades. From the shape of the raised bow and stern and the style of the decorations, we believe this represents a Cambodian, Thai, or Vietnamese type. A small passenger vessel, possibly a water taxi. We believe to be from Southeast Asia. The hardwood hull seems to represent a plank-built hull with a flat central bottom part and fore and aft bottom pieces that rise from it at angles. The thwart-seats and coach roof are carved with a geometric, possibly floral, design. The low main passenger seat (for two?) and the "floor" in front of it are upholstered with fabric. A pair of paddles or oars with heart-shaped blades are held in sockets directly behind the house. Two empty sockets in the thwart aft of them may have held another set at one time. Our guess is that the vessel operators would have stood on the aft deck. The gunwales rise to two points adjacent to the cabin and are reminiscent of the arrangement of tholepins on a Thames skiff, but we believe this is a superficial similarity only. In a real vessel of this type, the coach roof would probably have been lighter in relation to the rest of the boat -- probably of matting or cloth. A dugout (?) canoe. The men appear to be wearing fezzes and have negroid features. We assume this model is African. Alternately, the boat's shallow shape is reminiscent of some bark canoes of Australian Aborigines, but then the "fezzes" would have to be interpreted as a hairstyle instead. 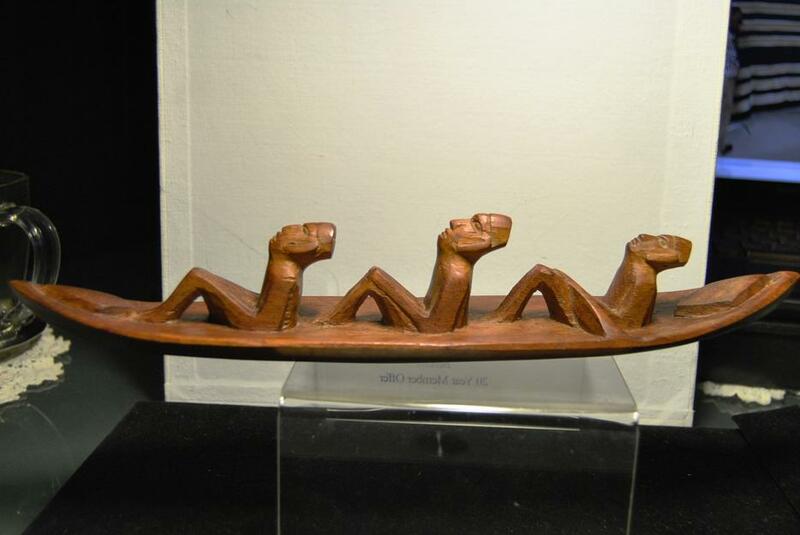 UPDATE: Mick Allen also identified this one as a carving from Kenya. He found a listing on Amazon of a nearly identical model here. It's so close that it appears to have been made by the same artist. Thanks again, Mick. The model builder was not trying to achieve a literal depiction of a canoe and its passengers. The hull is extremely shallow and hollowed only slightly. Aside from their heads and faces, the passengers are represented mainly as flowing shapes that merge smoothly into the bottom of the boat; they have no hands, and their feet and arms are only vaguely suggested. A paddle is suggested in the form of a heavy shaft that extends to the left of the bow paddler, although it has no blade at its end and does not extend beyond the gunwale. Lozenge-shaped objects at the bow and stern may represent cargo. Boat propelled by a kneeling paddler. The blade of the long-shafted paddle is broken off. We have no guesses about the provenance of the model or the type of boat it refers to. The exaggerated rise of the bow does not reflect any real boat's design and is the model maker's artistic vision in a piece that is intended only as a decorative item. The sides and top surface of the hull are decorated with vine-and-leaf carving. Although crudely formed, the human figure's posture does a nice job depicting the vigorous, muscular, yet graceful movement of paddling.